Wait, Now Solo Villain Enfys Nest Is a Dude? Is new Solo villain Enfys Nest a man or a woman? This is confusing. And some people don't even want to touch the topic for fear of inciting gender political rage. Others may find themselves in need of a Star Wars safe space as this all gets sorted out. Cause there is no clear cut answer at the present moment. Perhaps that's because there doesn't need to be. Maybe Enfys Nest is just a non-binary It who stands outside the cisnormativity as a genderqueer. Or maybe Nest is an asexual being devoid of any genitalia, what being from outer space and all. Seriously, who needs a gender specification in the deep reaches of the galaxy, or even in Brooklyn for that matter? As Bill and Ted so famously stated, we're all just dust in the wind, dude, or dudette, or dude-it. Ah, I give up. Is Enfys Nest a man or a woman? Or just...Neither? Where the hell is Ethan Van Sciver when you need him? He could sort this all out for sure. It had been reported earlier this month that the new Solo: A Star Wars Story villain Enfys Nest was a female by a French magazine. And everyone on the Internet ran with that as fact. No one from Lucasfilm, including Ron Howard, stated otherwise or bothered to jump in and clear up any confusion. However, it's beginning to look like something may have been lost in translation since a new officially licensed Star Wars magazine has now revealed that the villain is actually a male character. There still hasn't been any official word from any other sources, but it appears that Enfys Nest is a male character now. At least for the time being. Which could be short lived. There's still a lot of mystery surrounding the Solo movie and Enfys Nest is a big part of that mystery, even more so now. A new description from Star Wars Insider magazine has some new details about the villain, with the most glaring bit of information revealing that the character is a male. The information was found on Reddit, which goes against everything that was thought about the character for the last few weeks. The new Enfys Nest character description reads. "Busy carving out a nefarious reputation as the violent and enigmatic leader of a gang of swoop-riding pirates, the Cloud Riders, the deadly Enfys Nest is an extremely dangerous and brutal marauder. With his face always obscured beneath a fearsome helmet, Nest is deadly, athletic, and percussively vicious." Since this new information about Solo comes from an officially licensed source, it lends itself to be more reliable than the previous sources of information. This throws a monkey wrench into some fan theories, but it could be a way of Lucasfilm trying to further build up the mystery of Enfys Nest. It has been indicated that the character isn't even the main antagonist in the Solo movie, but that has yet to be confirmed as well. 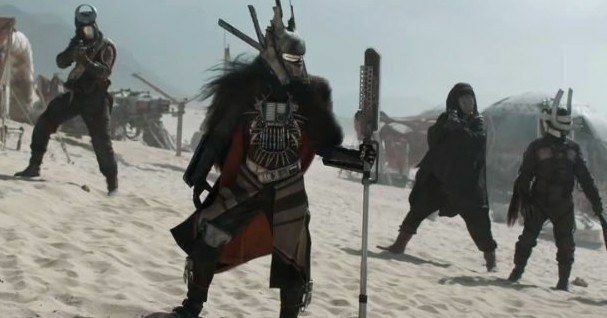 As far as official information about Enfys Nest in Solo: A Star Wars Story, screenwriters Lawrence and Jon Kasdan recently shared some new intel about the villain. Apparently, Enfys Nest has some connections to Woody Harrelson's Tobias Becket character. Additionally, the two confirm just how deadly the character is, echoing the sentiment from the recently released character bio. Lawrence Kasdan had this to say. "To understand who Enfys is... you gotta understand who Woody Harrelson plays, which is a character named Beckett, who is sort of a highly trained, very lethal criminal. He's a real pro, who's into big jobs, and he runs a crew. But one of their competitors is a sort of more pirate-like gang and the leader of that gang is Enfys Nest... All the movies build on the backs of the people that came before. Now we're in a certain galaxy so that's a certain kind of story. But it did give us enormous freedom to draw from whatever we wanted." Lucasfilm has gone to great lengths to keep the mysteries in Solo: A Star Wars Story unsolved before the movie hits theaters, and the questions about Enfys Nest are some of the proof. The actor/actress portraying the character hasn't even been officially confirmed by Lucasfilm or any of the cast and crew, which may throw away the rumors that the actress/actor signed a multi-picture deal to portray the villain. The good news is that there's only about a month to go before all of the mysteries about Solo are cleared up. You can check out the new character bio for Enfys Nest over at Reddit.